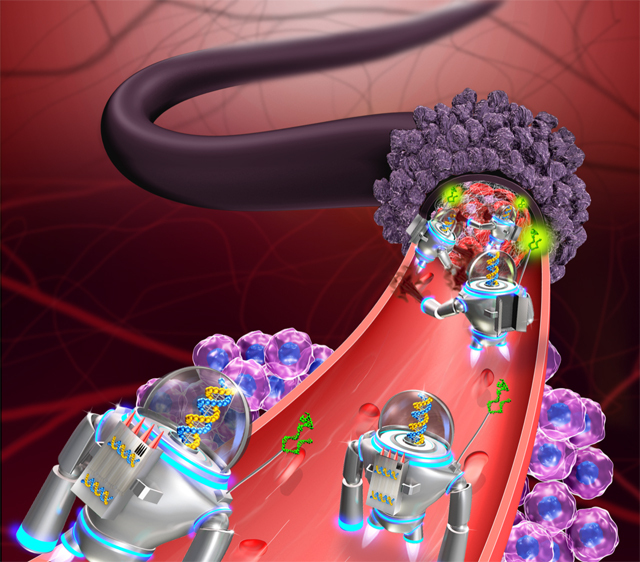 DNA nanorobots that travel the bloodstream, find tumors, and dispense a protein that causes blood clotting trigger the death of cancer cells in mice, according to a study published today (February 12) in Nature Biotechnology. Yan and colleagues first generated a self-assembling, rectangular, DNA-origami sheet to which they linked thrombin, an enzyme responsible for blood clotting. Then, they used DNA fasteners to join the long edges of the rectangle, resulting in a tubular nanorobot with thrombin on the inside. The authors designed the fasteners to dissociate when they bind nucleolin—a protein specific to the surface of tumor blood-vessel cells—at which point, the tube opens and exposes its cargo.